I used sterile soil and a sterile container to plant my atomic and dragon carrots in, but mushrooms keep sprouting up in their container every day. I don't know where they came from. Is this harmful to my carrots? 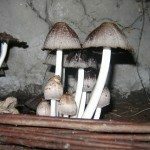 The mushrooms will not harm your plants and can even be beneficial. You can remove them if you want or just leave them.